First of all, failing to raise the debt ceiling would not automatically lead to a default on the national debt. The federal government would continue to collect revenue, and could use that revenue to pay debt obligations as they fall due, or in other words, pay the coupon interest on time. This would involve deep cuts to everything else, and if you are a professional politician that is synonymous with impossible, so there is an assumption that default would be the result. And that default would be â€œapocalyptic,â€ â€œa catastrophe,â€ â€œa disaster,â€ or would â€œcost us our credit rating,â€ â€“ which is doomed anyway because it is a mirage; the federal government is borrowing 40% of the money it spends this year and is projected to do so for the next ten. This is not a debtor worthy of a AAA rating, and the only reason we havenâ€™t seen a failed bond auction is because the Federal Reserve has been buying everything in sight. Professional politicians who never saw a dollar belonging to somebody else that they wouldnâ€™t spend, now lecture us on the importance of borrowing money to pay the obligations on the money they borrowed to spend on political goodies. 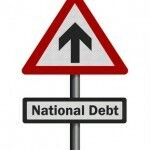 We are told of the need to increase our debts to stay current on our debt payments. When individuals pay debts with new debts (called â€œSurfingâ€ by finance experts) it is usually the last desperate trick before they call a bankruptcy lawyer. When our political overlords do it, they demand to be: 1. Re-elected; 2. Paid more; 3. Given a medal or an honorary Ivy League doctorate. The apocalypse for the Democrats is that this issue is coming to a head too soon. Over the next ten years, a majority of the baby-boom generation will be enrolled in Social Security and Medicare. And, as the American economy continues to die over the next ten years, it is thought that these voters will be more frightened of losing benefits than of the country collapsing under the weight of the debt. Government dependency is the Democratic Partyâ€™s stock-in-trade, and they will be there to defend all government spending with borrowed (or more likely, printed) money. In their calculation, if they can only delay the eventual tipping point where the economy just canâ€™t take more debt, then as things continue to get worse more voters will fear losing Big Government than losing everything to Big Government. While weâ€™re talking about Medicare, some time soon you should do a web search for â€œunemployed college graduates,â€ and see how many news articles you can find. Think about this: A generation wants to get government-financed benefits, while a younger generation is chronically underemployed and not paying much money in FICA (Federal Insurance Contributions Act), the tax that funds Medicare. No job means no wages; no wages means no FICA; no FICA means no Medicare â€“ unless they print the money and finance it with pure, un-tempered inflation. The professional politicians cannot get us out of this problem; it is in their best interest to make the problem bigger. The cynicism is downright psychopathic â€“ make sure that so many people depend on your appropriations that you cannot lose power even if the country is completely bankrupted. This, I fear, is what most Congressional Democrats, and probably most Congressional Republicans, intend to do. It must stop. It is time to stop rewarding politicians who successfully loot the public treasury by affixing their names to schools, institutes, nature trails and wildlife refuges as recognition of their long and illustrious careers of running the nation into serfdom. We need to put down the pride, the guilt, and the illusions of prosperity fashioned by self-interested politicians, and declare that we are the United States of America, Incorporated, and we are getting out of debt. If we donâ€™t, we will default eventually anyway either directly or through currency devaluation, but by then our nation will not have a future. At all.